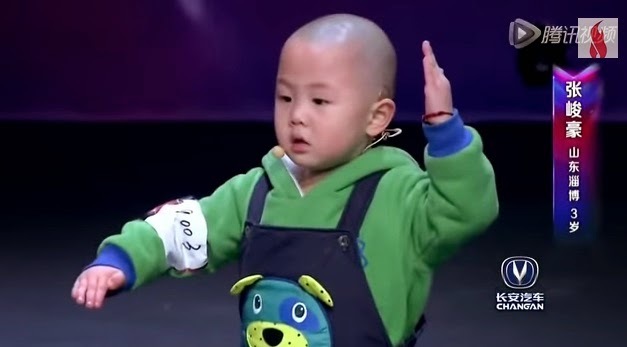 The adorable little boy named Zhang Junhao, which could walk at 10 months is now a Youtube sensation as one video upload now have nearly 14 million total views as of press time. Zhang definitely impressed famous martial artist Jet Li and millions of netizens worldwide with his random dance moves in a viral video. Zhang is a complete natural when talking with the judges of the 'Awesome Chinese' reality show. In an interview after his performance, the little Chinese boy thinks dancing will bring happiness to the world. Zhang also said: "When I dance, my mom laughs. My mom says laughing is happiness. My dream is to make people happy, because I'm happy." When asked what is his dream, he said: "May dream is to make people happy because I'm happy. Are you happy?" Share to the online world if you're inspired with the talented Chinese little boy. Let's share his happiness everywhere.